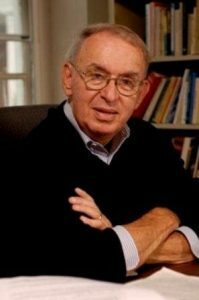 Joel Grossman, Emeritus Professor of Political Science and Academy Professor, died on June 2, 2018, after a brief struggle with cancer. He was 81. A renowned scholar of courts and the Constitution, Professor Grossman spent 33 years on the faculty at the University of Wisconsin-Madison before coming to Johns Hopkins in 1996. He was the author or editor of five books, including The Oxford Companion to the Supreme Court of the United States. He also authored a number of widely influential articles on courts and constitutional law. Professor Grossman served as editor of the Law & Society Review and received the Lifetime Achievement Award of the Law and Courts Section of the American Political Science Association in 2005. In 2007, Professor Grossman was recognized with the Krieger School of Arts and Sciences Teaching Award. He remained active as a member of The Academy after his retirement from the department in 2013, and in 2015, chaired a 14-member Task Force on Academic Freedom that was responsible for drafting a statement guiding academic freedom for the university community. A native of Brooklyn, New York, Professor Grossman completed his undergraduate degree in political science from Queen’s College, CUNY. He received his master’s and doctoral degrees—also in political science—from the University of Iowa. In retirement, Professor Grossman took great pleasure in teaching in continuing education programs and sharing his encyclopedic knowledge of the American legal system and the Supreme Court with new audiences. He was a devoted fan of the Yankees and the Wisconsin Badgers. According to his wife, Mary, he treasured his Sunday mornings on the basketball court at Vilas Park with colleagues and never gave up hope of perfecting his jump shot. Professor Grossman’s longtime colleague, Professor Steven David, director of undergraduate studies in the Department of Political Science, also shared this reflection: “I saw Joel a couple of times after he became sick, the last time just several days ago. As always, he took great pride in the accomplishments of his family. He also remembered happily his time at Wisconsin and Hopkins. He was proud of the many graduate students he saw to completion and that some of his undergraduates wound up clerking for Supreme Court justices. At a tough time for the department, Joel stepped forward to serve as chair, something we all greatly appreciated. He always had time for his colleagues and especially for his students, many of whom he kept in touch with. In addition to his wife, Professor Grossman is survived by two daughters, Joanna and Alison; son, Daniel; and five grandchildren. For those wishing to honor Professor Grossman’s memory, his family asks that you consider contributing to a charity that supports civil rights and those underrepresented in our legal system, issues that were near and dear to his heart. We send condolences to Professor Grossman’s family and to his colleagues in the Department of Political Science and in The Academy.